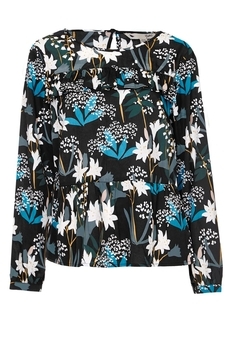 Yumi London Lily Snowdrop Ruffle top is perfect for dressing up or down. With an on-trend frill across the front, a peplum hemline and a stand-out print on light-weight fluid fabric will make you go through seasons in style. It features round neckline, long sleeves, teardrop cut with button at the back, it is not lined and is approx. 60cm in length. Winter collection. Composition: 100% Polyester. Color: Black.